Defending champion Novak Djokovic will take on third seed Stan Wawrinka in the US Open final after both men won semi-finals in punishing conditions. Djokovic beat 10th seed Gael Monfils 6-3 6-2 3-6 6-2 in New York, with the Frenchman adopting unusual tactics to try and counter the world number one. Stifling humidity was still a factor as Wawrinka beat Japan's sixth seed Kei Nishikori 4-6 7-5 6-4 6-2. "It's really humid, really hot. I knew it would be tough," said Wawrinka. 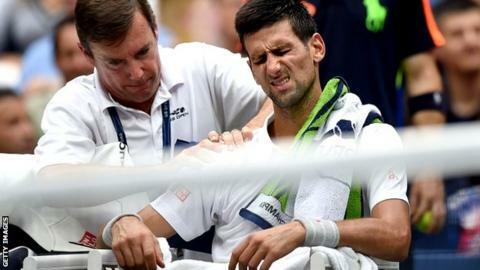 Djokovic, 29, had treatment on both shoulders during the first semi-final, while Monfils could barely move at times as conditions took their toll. "Humid," is how the Serb described it. "I think that's all we were thinking about and feeling." Monfils robustly rejected the notion that he did not give his all, saying: "I think I tried my best." Djokovic will attempt to win his third US Open and 13th Grand Slam title on Sunday, while Wawrinka - who beat Djokovic in last year's French Open final - is going for a third major victory and first at Flushing Meadows. Djokovic had spent only six hours and 24 minutes on court in reaching the semi-finals, thanks in part to one walkover and two retirements, and he was within sight of another swift contest against Monfils. He led by two sets and a break as Monfils spent much of the first hour hitting the ball at half-pace, barely moving during, as well as between, points and at one stage limping theatrically. However, he raced forward to collect a drop shot and break back in the third set, sparking a run of five straight games. Djokovic's fortunes took a nosedive, first as he called for treatment to his left shoulder and then as three break-back points slipped by, and with them the set, prompting him to rip his shirt in frustration. Monfils, 30, was back in the match but he was hardly fizzing with energy, calling for the trainer early in the fourth set, bending double at every opportunity and even drinking a Coca-Cola at one changeover. Djokovic handed another break of serve straight back with a double fault, but after a second medical timeout - this time for his right shoulder - the two-time champion clinched victory with a winner on match point that flew past an almost stationary Monfils. "The conditions were different from most of the days during the tournament but it was the same for both players," said Djokovic. "We expected it - we heard it would be warm and humid." Monfils said: "At the beginning I think Novak has been good, I didn't serve great, it was very quick 5-0 and I got to change a little bit. That's a little bit tough because for sure people aren't ready to see that. "But why would I stay 6-0 and not change anything? Definitely, I tried to get in his head and create something new for him to see." Wawrinka and Nishikori played out another gruelling contest as the temperature and humidity remained brutal for the second semi-final, with the Swiss proving just the stronger. Nishikori looked sharper for the best part of two sets but was pegged back by Wawrinka with a break at the end of the second. The Japanese player appeared to be suffering for his four-hour quarter-final win over Andy Murray but he recovered from 4-1 down in the third to level, with play interrupted briefly as rain forced the roof to be closed. A relieved Wawrinka let out a huge roar when he saved a break point at 4-4 and powered through five straight games to move a break up in the fourth. There was one final push from Nishikori, who broke back when Wawrinka played a woeful service game at 3-2, but the former French and Australian Open champion reeled off another three games in a row to clinch victory. "Kei is a tough player and he played well from the beginning," said Wawrinka. "I had to wait and fight and make him a bit uncomfortable and he started to get tired. "That is when I put my game to be aggressive. To be in the final is something crazy."